The Village has once again teamed up with the Conservation Foundation to secure an all-time low price for the purchase of industrial grade rain barrel containers! Don't jack up your water bill with lawn-watering and home car washes from the tap. Instead, use rainwater retained in a rain barrel for these chores and more! If you don't take advantage of this special environmentally friendly, limited time offer to buy a rain barrel in time for summer, all that precious water flowing through your gutters will be swept down the storm drain. Don't pass up this opportunity and reserve your rain barrel online today! 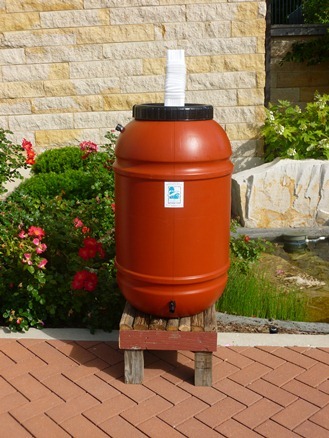 Rain barrels cost $55.00-60.00 each and can be ordered in black, blue, grey or terra cotta (pictured). Wooden stands, installation, and accessories are available at an additional cost. The pick up date for non-home delivery orders is May 21, 2019 from 11 A.M to 5:00 P.M. at the Village Hall at the River Street door. Alternative pick-ups can be arranged. Order your rain barrel online by May 17, 2018 to pick up in person on 5/21/18. *All rain barrel orders shall be completed online. Payments can either be made online or through the mail by sending a check.